Martin of Troppau (d. 1278) began his career as a Dominican in Prague, later becoming papal chaplain to three successive popes in Rome. His Chronicle became very popular: in its original form popes were arranged on one page, and the corresponding emperors on the facing page, with 50 lines per page, making it easy to compare papal and imperial history. 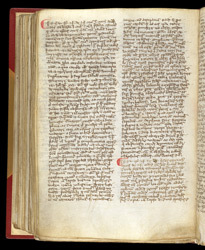 This manuscript was owned by Bardney Abbey, between Lincoln and Horncastle, and was probably written there. This page contains copies of documents relating to Bardney. Heavily abbreviated and written in cursive script, the first lines includes '. . . frater N. de N., monachus monasterii de B. . . .' (. . . Brother N. of N., monk of the monastery of Bardney . . .); the second mentions 'frater N. de Bardney' in its first line.